The Honda S2000 routinely hits “modern classic” lists thanks to its high-revving screamer of an engine. Swapping the engine for anything else earns you a strong side-eye from Honda fans, yet that’s what makes this electric-swapped 2006 S2000 so wonderfully enticing—not to mention ridiculously fast. Instead of that treasured rev-happy F22C1 Honda inline four sits an all-electric drivetrain using a mishmash of Tesla and Chevy EV parts. The motor’s in the back now! And as you can see, it rips. 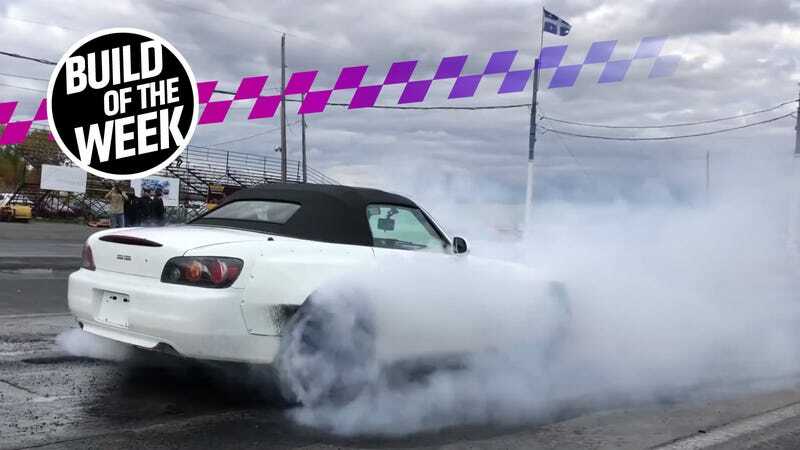 Believe it or not, Guillaume André did this out of respect for the infinitely lovable S2000, as his first car was an S2000. 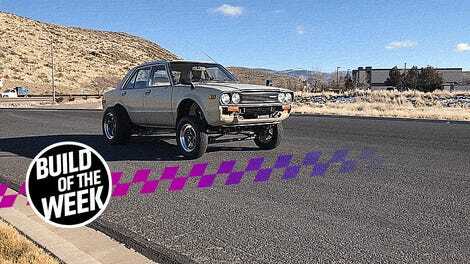 When a rough example in California with a poorly running engine came up for sale in an online auction, he jumped at the chance to make one into an insanely fast EV. André’s newly purchased S2000, as it came. The convertible top had definitely seen better days. He and his electric car-oriented shop weren’t going to use that well-loved F22C1 engine, so it didn’t matter that it wasn’t running right. Besides, there’s a good chance that its parts lived on to keep another S2000 alive, as the crew removed and resold anything they weren’t using in the EV build, including the S2000's original engine, transmission, rear axle and subframe, plus some other odds and ends. This isn’t André’s first foray into electric cars, either. His family owns the Véhicules Électriques Simon André EV shop in Trois-Rivières, Quebec, which does electrical, mechanical and body repairs on all things EV. He enlisted the help of his shop’s EV technician Sylvain Belanger as well as Frederick Prigge, Olivier Coté and Hugo Normand from the Institut du Véhicule Innovant applied science research lab. IVI also works on hybrid and electric vehicles, among other projects. If you noticed that the S2000 now wears a fancy set of over-fenders in the rear, there’s a good reason why. The entire rear axle of the S2000 was replaced with a Tesla Model S axle (complete with drive unit and brakes) modified by Jason Hughes at 057 Technology. 057 used to be called HSR Motors, which may sound familiar to frequent readers of this series as it was the same supplier Jim Belosic used for his somewhat viral “Teslonda” build stuffing Tesla gear into a 1981 Honda. That car, maybe more than anything, proved just how desirable an EV swap can be. Anyway, the Tesla rear axle sticks out a bit more than the stock S2000 one, hence the fancy flares. Hughes supplies a lot of components for crazy swaps like this, as he was the only person to Prigge’s knowledge who sold already modified Model S motors with the controller to use as a fairly plug-and-play solution. This saved the team the ton of reverse engineering time needed to make a regular Model S salvage motor work on their own, while still letting them use one of the most powerful and capable EV motors on the market. For this rear axle assembly, Hughes tweaked the firmware in the motor’s inverter so it could produce 475kW, or 1400 amps. He also shipped a custom controller with the assembly that manages the acceleration and deceleration of the motor itself. André’s finished car puts down 636 horsepower and 480 lb-ft of torque—nearly three times what the stock combustion engine made. It’s a tidy swap, especially considering how alien the new drivetrain is compared to Honda’s original. The team was able to reuse the original bolt holes for the S2000's rear axle by making a custom frame support to attach the Tesla rear frame. Belanger told Jalopnik that because they were able to reuse the stock bolt holes, the Tesla rear frame support is now a direct fit that’s easy to take on and off, just like it belonged there in the first place. One motor, fresh from 057 Technology. New rear axle assembly, complete with motor. Fitting the rear axle assembly into the car. That said, getting all of this to fit inside was a lot tougher than merely bolting up the frame. For one, they needed to ensure the S2000 body wouldn’t twist apart from all the extra torque going to its rear wheels. After the frame support was tweaked, more parts were welded together to provide extra strength. They also modified the chassis in the rear to fit the race coilovers they wanted to use, too. “The chassis has been modified, welded, whacked at, cursed at, etc. to get the axle to fix and not tear apart with such a huge load,” Prigge explained in an email to Jalopnik. Powering those meaty drive motors are two repurposed second generation Chevy Volt 18.4 kWh battery packs, installed in parallel and connected to a 7.2 kW onboard charger from a Chevy Bolt. The battery packs had been taken out of 2017 Volt salvage cars they had at André’s shop. The Volt batteries could handle the high current requests of drag racing, so in the car they went. On top of that, the crew had already reverse-engineered most of the messages used by the Volt’s battery management system in the process of building another EV project, which made this pack simpler to adapt to whatever they wanted to use it with. This kind of mashup isn’t all that rare in this world of custom EVs, where a mishmash of available parts come together out of what’s easy and available. It’s very hot rod in spirit. Test-fitting how the batteries will fit into the front of the car. The team also used a Chevrolet Volt DC/DC converter to convert the 360-volt high voltage of the car into 12-volt power that’s used to both charge its normal 12-volt battery (which is still there!) as well as power lights and other onboard accessories. This converter plays much of the same role that alternator does for a conventionally-powered car. Fortunately, the fact that they had two Volt battery packs allowed them to distribute the weight more evenly across the car. Each battery consists of three modules that were separated to fit better inside the hood and trunk of the car as well as to keep from having one big lump of weight in the car. One battery sits under the hood up front, and the other is in the trunk, above the motor. As a result, 60 percent of the car’s weight is on the back axle, which also helps weigh down the S2000's drive wheels for more traction. The finished car weighs 3,075 pounds, which is about 200 more than stock but light considering all the batteries that went into it. After the battery modules were installed, the high voltage connection between the different modules went into the car, complete with a safety disconnect. Installing batteries under the hood. A big challenge was keeping all of these new electrical components cool enough to work properly in a chassis never designed for them, so the team custom-built an entire cooling system for the car. Each battery has its own separate high voltage circuit, 12-volt circuit and cooling loop. Both batteries are wired into a custom junction box built for the car, which contains high voltage contactors and two 800-amp main fuses before power is sent to the Tesla drivetrain. While we usually think about keeping road cars’ mechanical bits cool, Prigge explained that you actually heat the car’s NMC lithium-ion battery cells up for maximum performance. That involves a tradeoff with longevity, but on a drag build like this, it makes sense. To heat up the battery for runs, the team used a 120VAC heater to warm the onboard coolant fluid and then forced that hot fluid through the battery’s coolant system in between passes. Formerly, they could only do this while the car was stopped. However, this process will change next year, as André installed a new high-voltage glycol heater inline with the cooling loop for this purpose. Meanwhile, Normand got to work reverse engineering these components’ systems to write custom software that acted as a CAN bus bridge. CAN (which stands for “controller area network”) bus is standard for modern cars, the protocol that allows different electrical components in a car to “talk to” each other directly. There needs to be a bridge between the different Chevrolet and Tesla parts’ already-programmed CAN bus systems, as different components are programmed to work with other things built for the cars they came out of—not what’s been put into this S2000. Normand’s programming work also allowed them to monitor the voltage of each battery cell, the temperature of each battery module, current and voltage of each battery pack, and balancing requests (which makes use of all the cells in a battery to provide the maximum power available as well as lengthen battery life) sent to the batteries. More custom software programmed by the team controls the high voltage sequencing and automation as well as the safety monitoring that keeps them from getting electrocuted. The four CAN buses (for the front battery, rear battery, plus the 057 Technology hardware controller and the motor itself) were connected to a 10-inch Parker MD4-10 controller inside the car, which serves as the main user interface for all the vehicle’s functions. The Parker MD4-10's touchscreen interface sits Model 3-style in the middle of the dashboard. A central touchscreen allows access to all the car’s vital functions. The IVI team ran through numerous dyno runs to make sure everything was working correctly before handing it back to André’s shop for the final touches. It’s worth noting here that working on high voltage electric vehicle systems is dangerous—and a new, fun and different kind of dangerous than the Porsche engine block that you nearly dropped on your foot that one time. Unlike the Teslonda’s builder, these guys actually recommend that you don’t try this at home. “We do this for a living, designing OEM vehicles, we are a bunch of electrical engineers,” Prigge noted. If you do it anyway, please be careful! They’re by no means done tweaking André’s S2000, either. André took the car home over the winter to make a number of cosmetic tweaks. More importantly, they plan to run it a lot more, in hopes of picking up some tried-and-true drag racing tricks along the way. The car uses a combination of skinny three-inch drag tires on the front and 245/40R18 Hoosier drag radials on the rear for track use. For reference, the “10-second car” is the gold standard as defined by that great holy tome of the automotive world, the Fast and Furious series. They’re already down to 10.243-second quarter-mile passes at their home track, Napierville Dragway. On those runs—all of which have been made in colder, 44° to 57° F weather—the car hits 126.3 mph. But they’re improving their times with the world’s quietest S2000 every time they go. “We have gained about 1.3 seconds in just three outings to the track!” Prigge said. Prigge says they’d like to tune their launch technique and how the car uses its torque better, and also try out an external chiller to freeze the motor and controller before each run. Currently, it’s getting a bit too hot for optimal performance in the second eighth-mile of their drag runs. Freezing these components before their runs should help with that. “We currently have a 0-60 time near 2.2 seconds, so Elon Musk better be ready with his 1.9-second Roadster 2.0,” Belanger told us. I’m rooting for the home build on this one. If you’d like to keep up with this delightfully heretical build, keep an eye out for more videos on IVI’s YouTube page here, or updates on IVI’s Facebook page here or Véhicules Électriques Simon André’s Facebook page here. And of course, if you have any trick drag racing tips for the crew, drop them in the comments below. The hardware controller that works with 057 Technology’s motor.